Toby Price of Australia during a victorious Stage 11 of the 2018 Dakar Rally. 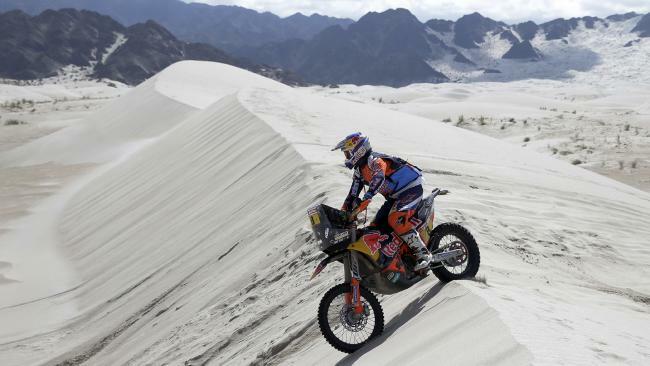 MOTORSPORT: KTM rider Toby Price has won the bike stage while Toyota's Bernhard Ten Brinke took stage 11 of the Dakar Rally as defending champion Stephane Peterhansel and his Peugeot teammate Carlos Sainz continued their duel for the overall lead. Price, who was followed by Argentine Kevin Benavides and Frenchman Antoine Meo, moved up to third in the overall standings, as his teammate Joan Barreda Bort withdrew. The Australian bounced back after a disastrous 10th stage where he lost almost 50 minutes after getting lost in a river bed. Ten Brinke dominated the car stage, finishing more than four minutes ahead of Peugeot drivers Cyril Despres, Sainz and Peterhansel. The Dutchman needed 4 hours, 10 minutes, 54 seconds to cover the 280km between Belen and Fiambala/Chilecito, Argentina. Toby Price won Stage 11 of the Dakar Rally. Despres of France was 4:35 behind in second place, with Spain's Sainz taking third, 4:40 behind. In the overall classification, Sainz gained 10 seconds from the previous stage and now leads second-placed Peterhansel by 50:45. "Fiambala is a classic Dakar special," Sainz said. "This is where I lost the Dakar in 2009. I started the stage with a margin of 30 minutes and ended up in a hole, so it's great to put it behind me." In the bike class overall, Austria's KTM rider Matthias Walkner leads Benavides by 32:00 and Price by 39:17.